If you are in the market for a new swimming pool, one of the first things you will have to decide is whether you want an in-ground or an above ground swimming pool. While both types have their benefits, in-ground swimming pools are considered to be the more luxurious option and with that luxury comes some additional benefits that you might not have considered. Here are three reasons why in-ground might be the right choice for your new swimming pool. Above ground pools do come in different shapes and sizes, but once you’ve seen one of them, you’ve pretty much seen them all. Because in-ground swimming pools are installed, well, in the ground, they can take advantage of the surrounding landscape to really craft a unique look. For example, if your yard has a natural slope to it, you could create a pool with two levels and have a waterfall feature that naturally cascades down to the lower level. Regardless of the direction you decide to go, an in-ground pool will simply blend in better with the rest of your landscape instead of sticking out like a sore thumb. Yes, in-ground pools do generally cost more than above ground, but with that extra investment comes extra durability. An in-ground pool is usually crafted from much stronger materials than your typical above ground pool and you can expect that your in-ground pool will last for many, many years with proper care. While there are exceptions depending on how and where it is built, most above ground pools require the swimmer to climb up a ladder or at least boost themselves up in order to get in. If you have disabled, elderly, or especially young children in your household, this might not be ideal. Also consider that most above ground pools have the same water depth throughout, which is another potential safety hazard depending on who is using it. An in-ground pool can be designed to allow swimmers to wade in through shallow waters and then the swimmer can decide to go to the deep end only if they feel it is safe to do so. 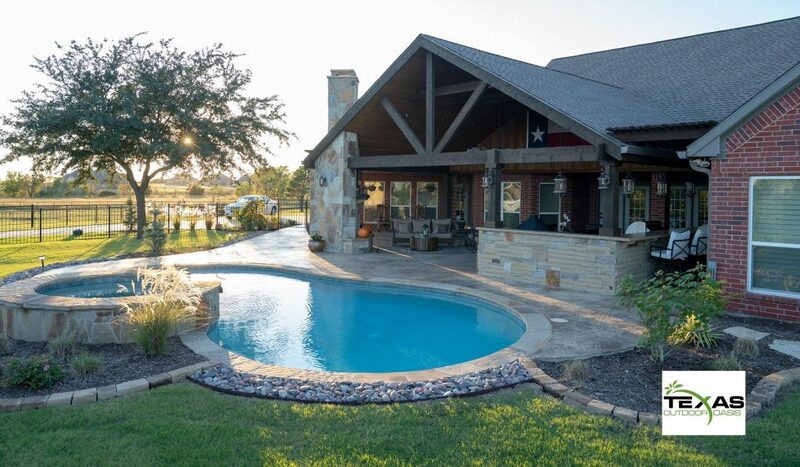 Contact Texas Outdoor Oasis today for more information on in-ground pool installation. We are a home exterior service company located in Wylie, Texas. We provide homeowners, builders and general contractors with custom pools, patio covers, landscaping & outdoor kitchens without the hassle. We have over 20 years of experience in outdoor living in the DFW area. We provide homeowners, builders and general contractors superior service that is hassle free. Contact us today!